While Hubs and I were visiting in Ohio mid July, I had a chance to stop in at a local scrapbook store. I was looking for some stitched dies, but found none. I did however find this stamp. Its a great guy stamp and I made a card as soon as I got home. It has been sent off in the mail, or I would re-photograph the photo with some staging. Next time I promise! It was a lot of fun to color, and I added some really sparkly glitter to mimic the sunshine bouncing off the water. Doesn't this look like a great place to chill out and enjoy a summer's afternoon? It does to me. The stamp is from Northwoods Rubber Stamps and I can see lots of cards being made with it. I still reach for the watercolors when I need to make a card. This birthday card was a lot of fun to make, and the watercolor panel, looked kinda meh when it was wet, but I absolutely am thrilled with it dry. I love this Simon Says Stamp set, its a wonderful big birthday wish! After water coloring the panel with Koi water colors and heat gun drying it, the sentiment was stamped with smokey grey versafine ink and heat embossed with clear powder. 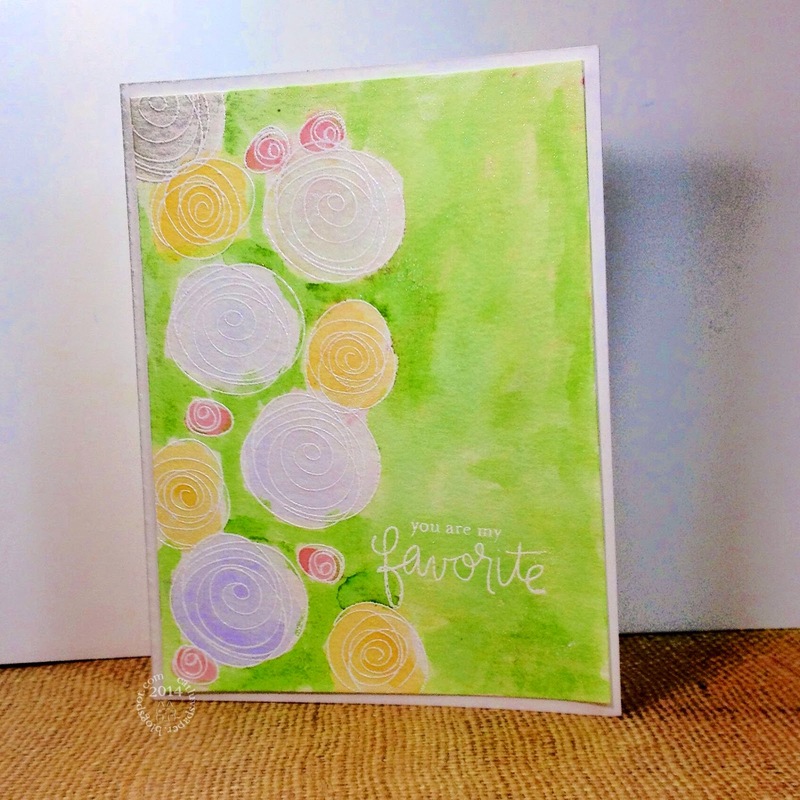 The patterned paper was left over from a Simon Says Stamp card kit. The flower is from Michaels, and the twine and button were a gift. I popped up the center panel after matting it in black. I am entering it in the Simon Says Stamp Wednesday Challenge -Emboss it. This afternoon, I participated in my beloved Hero Arts Scramble. Judy was our hostess and provided us a theme of pastels with a touch of black. She provided 3 sample cards, one of which had some black gingham ribbon. That bit of ribbon got my creative juices going. I looked through my stamps and picked out an older set from Hero Arts - AC005 Untitled Word Shadow. they are circular shadow stamps-meaning most of the image is the cutout on the stamp. For my background I picked CG211 Magical Background. I love dots as much as I love gingham. I couldn't decide which of the round stamps I wanted to used there are 5 or 6 them. I have 4 rolls of gingham ribbon, so I picked out three of the stamps and three shades of ink that might be considered pastels (I am a bold color gal normally) and went to work. I cannot believe I got all three done and posted in 90 minutes. Lately it has taken me almost that amount of time for just one card. A blogging friend Barb takes such beautiful pictures of her gorgeous cards, and has inspired me to work on my card photos. So I retook my card pictures from the scramble, added a little staging and a background with some pop, but not I hope enough to overwhelm the cards. I inked and clear embossed some wood veneer pieces for the little bit of something in the foreground. I started with one card from these vinyl stickers, and then decided I had to make a card set. Three didn't seem enough, and then I found two more stickers. All roses have heavy wink of stella coverage and shine so prettily in the sun. They have been all wrapped up with stamps and a pen and will be gifted shortly. My Paris loving friend's birthday has rolled around again. So I have made another card for her including an Eiffel Tower die cut. I stacked that die about 8 times to give it some heft, and then clear embossed the front of it three times for some shine. 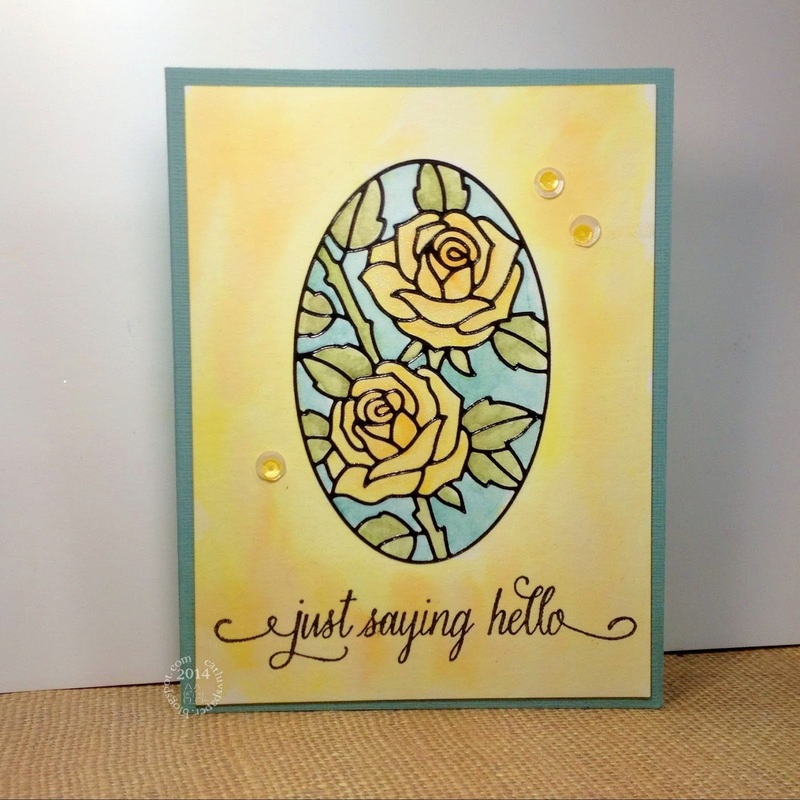 The flowers are Stampin Up, the Lattice background is from Hero Arts, and the sentiment and pearls are from Simon Says Stamp. Last year's card can be found here. I made this card to send to my Dad. We video chat a couple of times a week, so I get to see his face and the antics of the kittens. We talk or text almost every day as well...but its not being there. Supplies - watercolor paper, distress inks, Elizabeth Craft vinyl sticker, Glitter Ritz super fine glitter, Simon Says Stamp stamp set. I think he'll enjoy this surprise card. I have been wanting this die from Simon Says Stamp for a while now, and I saw it being used beautifully lately at Lin's blog here and here. Seeing her gorgeous cards, so beautifully designed really increased my desire to get the die ordered. It arrived this week, and I put it to use making this thank you card. 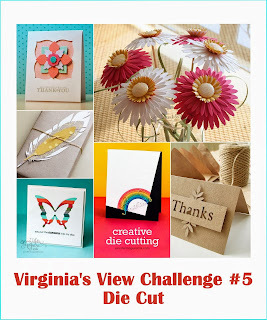 I am entering this into Virginia's View Challenge #5. I colored the petals with Copics, then added a bit of clear Wink of Stella. The center gems are from Queen and Co, they are kind of checkerboard cut and I thought they would make perfect flower centers. 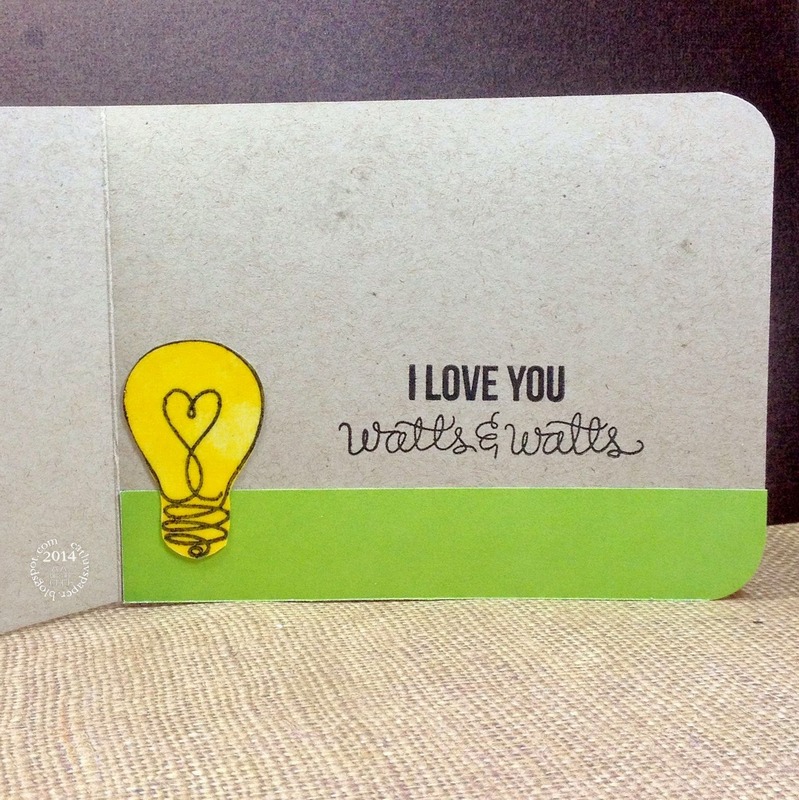 My sentiment is also from Simon Says Stamp. 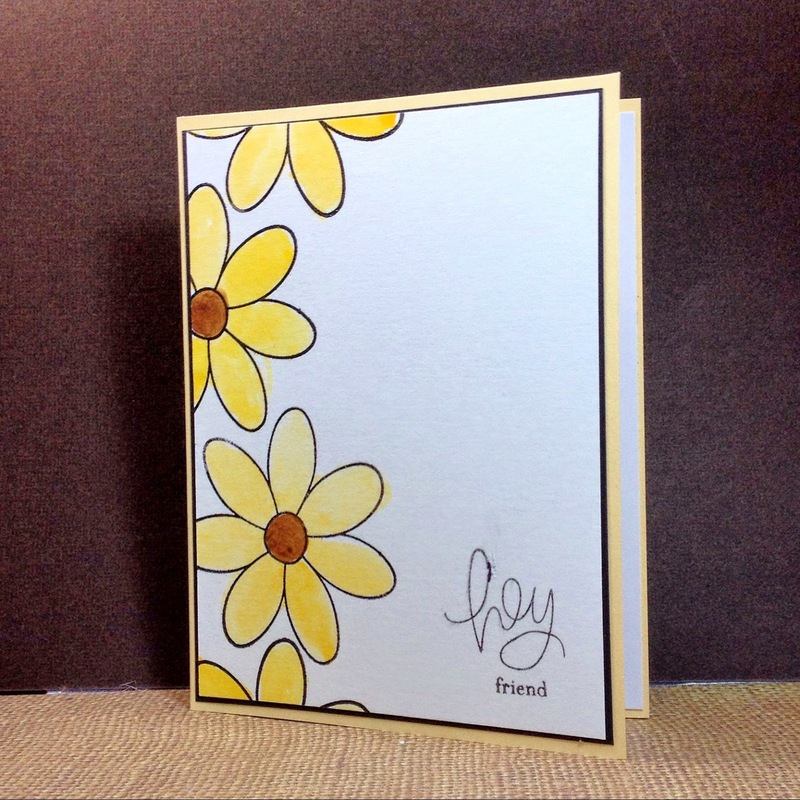 I have layered a piece of yellow cardstock between the front panel and the card base so that the yellow hue shows behind the petals. A glittery card for my MIL...she likes the sparkly cards as much as I do. This one should light up the place when the sun hits it. I used vinyl stickers by Elizabeth Crafts. Watercolored using distress markers, then dowsed it in yellow stickles. 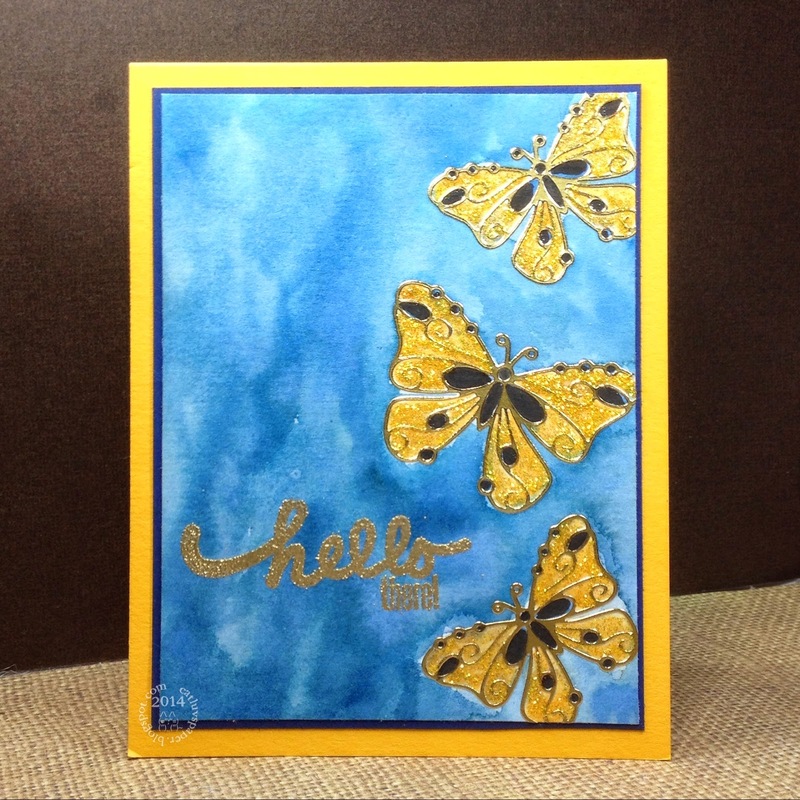 Embossing powder was Hero Arts, sentiment Jillibean Soup. I was able to play in another Hero Arts Scramble at their flickr gourp. Our hostess was Theresa and her theme was floral with stripes/plaids/checks. I knew exactly what I wanted to do, and my card in reality is fairly close to my vision in my head...that rarely happens! I used the Hero Arts Brushstrokes set to create some "lines" on my card background. Then I Stamped Hero Arts Night and Day Flowers on top of the dried inks. 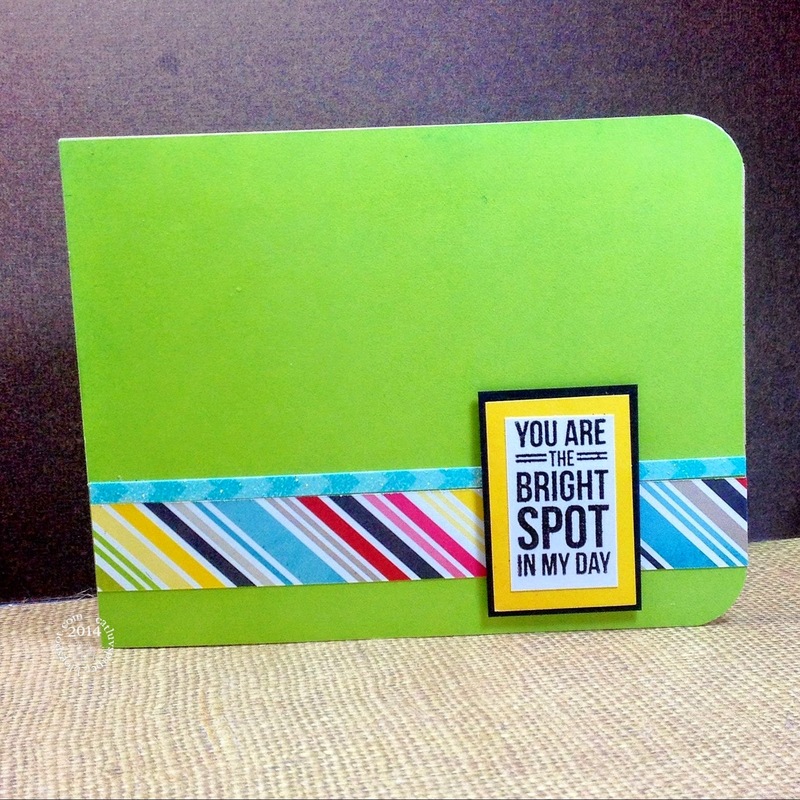 Next I used Impression Obsessions thin lines background stamp to add some tone on tone lines to my card base. Then disaster struck! I had about 20 minutes left of the 90 allotted. I only wanted to use part of the flower panel, so I trimmed it. I have to say I didn't take just a bit off and then more and more...no I whacked a whole bunch off the right side and less off the left. I wanted the brush strokes to be edge to edge. I added a bit of glitter paper on the left side and mounted my flower panel...ugh...too much card base was visible on the right and I hadn't put a sentiment down yet! So I grabbed my cut scraps, and trimmed them. I cut thin pieces of black card to look as if there was another layer. Then I just added the re-trimmed inked pieces to the card front with a bit of black edging. My foam dots were very cooperative and allowed my Hello to stamp cleanly even though it was not a flat surface. Lastly a few blush colored gems and YEA the card was saved! Inks - Onyx Black Versafine, Hero Arts -Pale Tomato, Field Greens, Green Hills, Cornflower, Soft Apricot, and Fresh Peach. Okay, I admit...I love getting that Simon Says Stamp monthly card kit box on my doorstep. I love opening it up and taking a close look at all those fun papers, stamps and other goodies. Then I try out the stamps making sure I get a good image from each, then stamps are cleaned and then box sits on my shelf. I have made it a priority to start playing with these goodies. 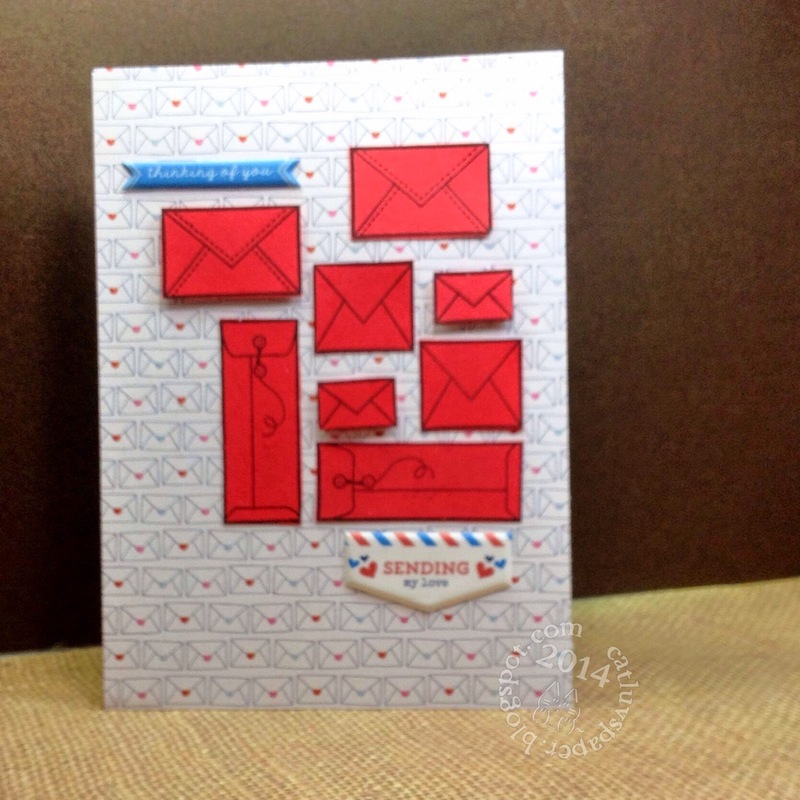 You can see my cards from previous kits by clicking on my sidebar label listing for Simon Says Stamp Card Kit. I have to say this month's (July) is my favorite! I was up late making cards last night, and back at it this morning early...7:30 am. Had insomnia, went to sleep at 2:30 and was up at 4 and 5:30. I gave up at 7:30. The kit reminded me of my Mom pulling out the old airmail paper that was so very thin; and writing letters to our relatives in Europe. So with happy memories of my Mom, I set to work to make some quick but fun cards. 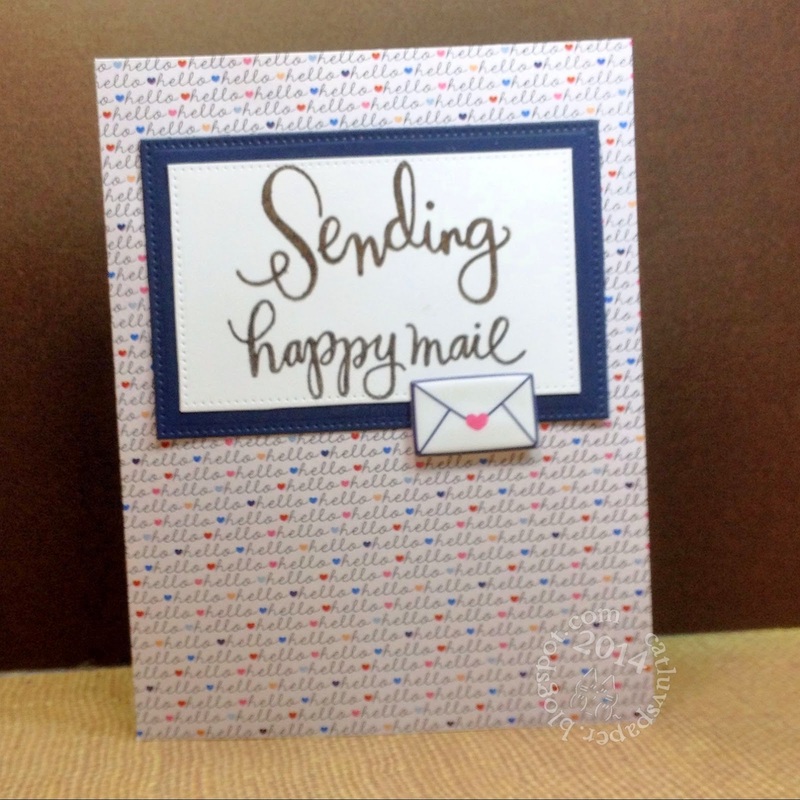 This kit has such a fun mix of papers, stamps and embellishments! The embellishments are puffy vinyl stickers and are adorable. I only added a few bits not in the kit. 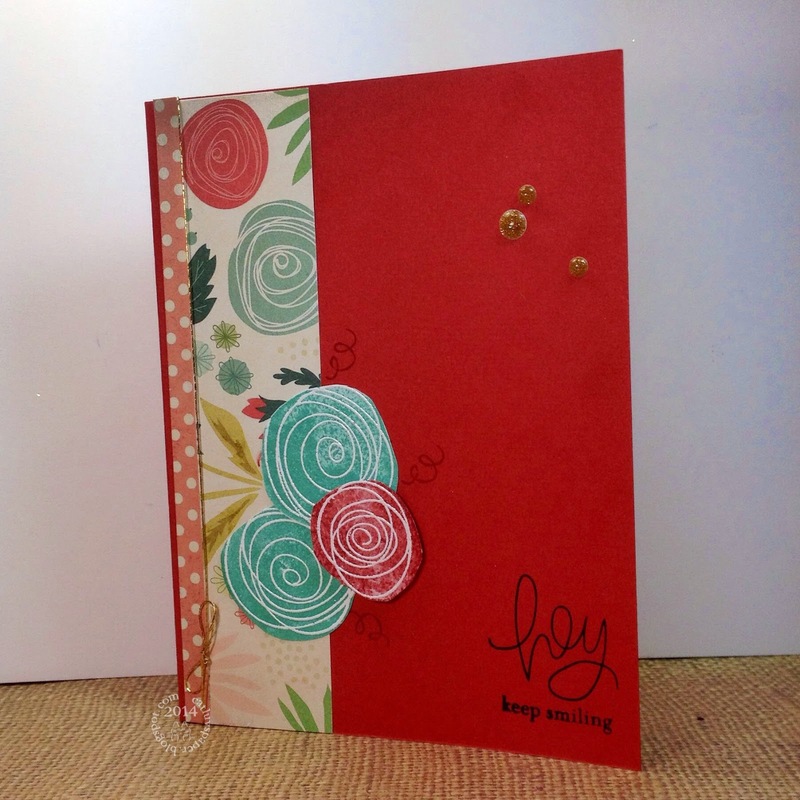 I even made a few embellishments, and will enter one card to the SSS Monday Challenge, Start from Scratch. 1.This one I just matted the sticker on navy cardstock. 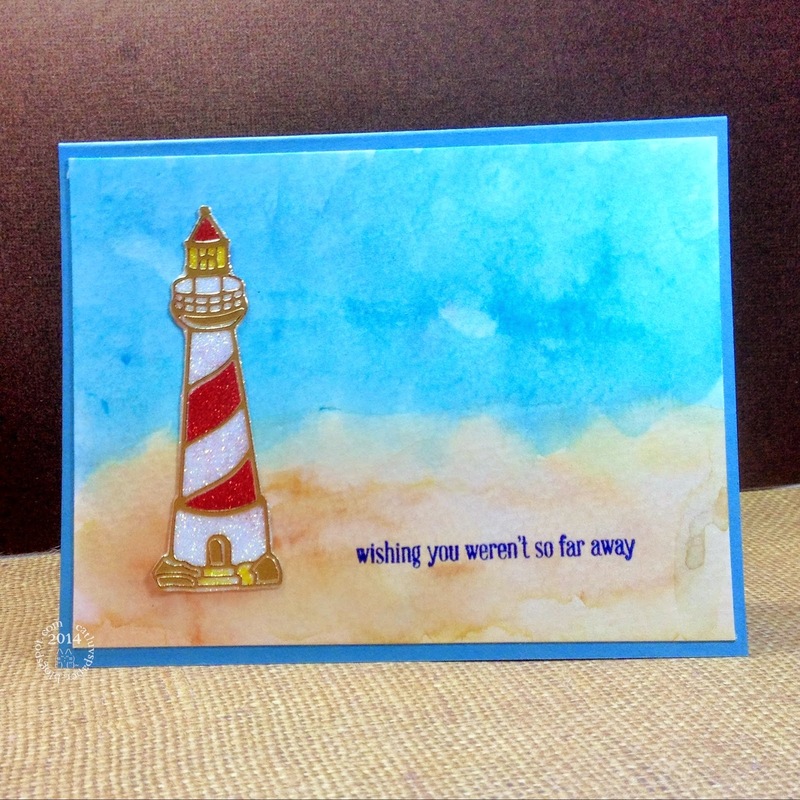 Embossed the sentiment below with white HA embossing powder. 2. 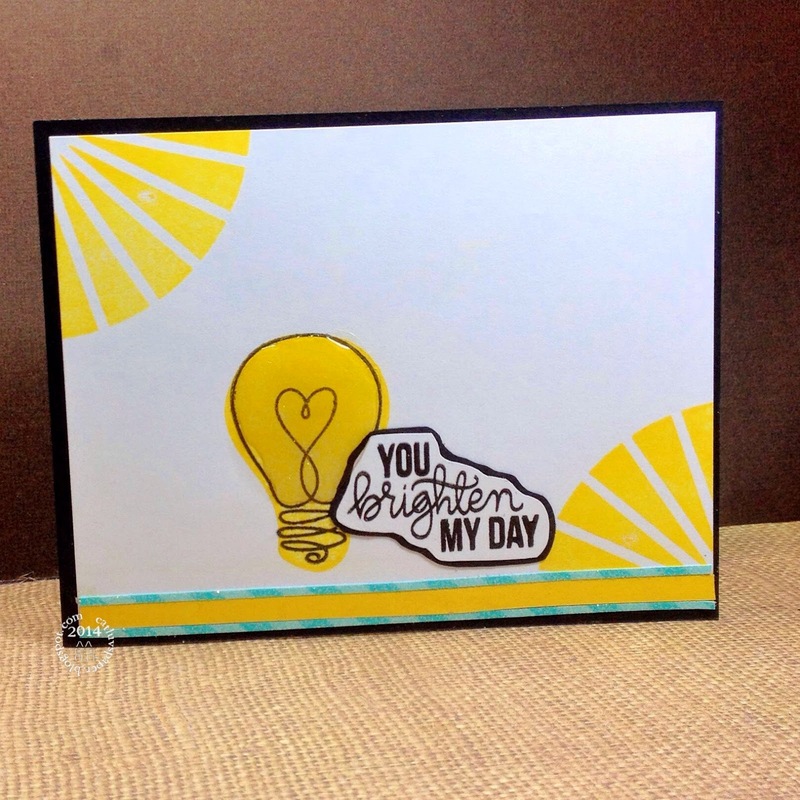 Simply a matted sentiment with a cute puffy envelope raised on foam adhesive. 3. This one, I had stamped and the greeting and added a smaller greeting below which got lost in the dots. So time to make a matted sentiment. 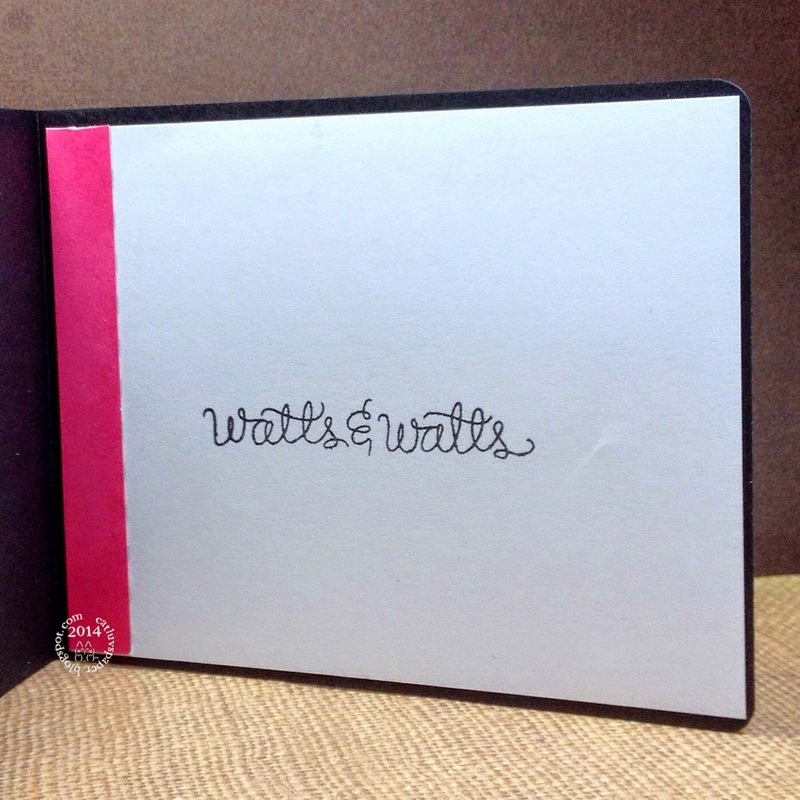 I like that it stands out with the matting and the patterned paper orientation is switched. That hello circle is stamped, and covered with glossy accents so that it too has dimension along with the two puffy stickers. This one I am entering to the challenge. 4.I kinda fell in love with the navy paper with the tiny heart dots, had to make this little flag. Seemed perfect for that sticker. 5. This one has lots of flat hearts clear embossed, and one puffy sticker heart along with the puffy envelope. 7. A window card with some glitter paper surrounding the window. 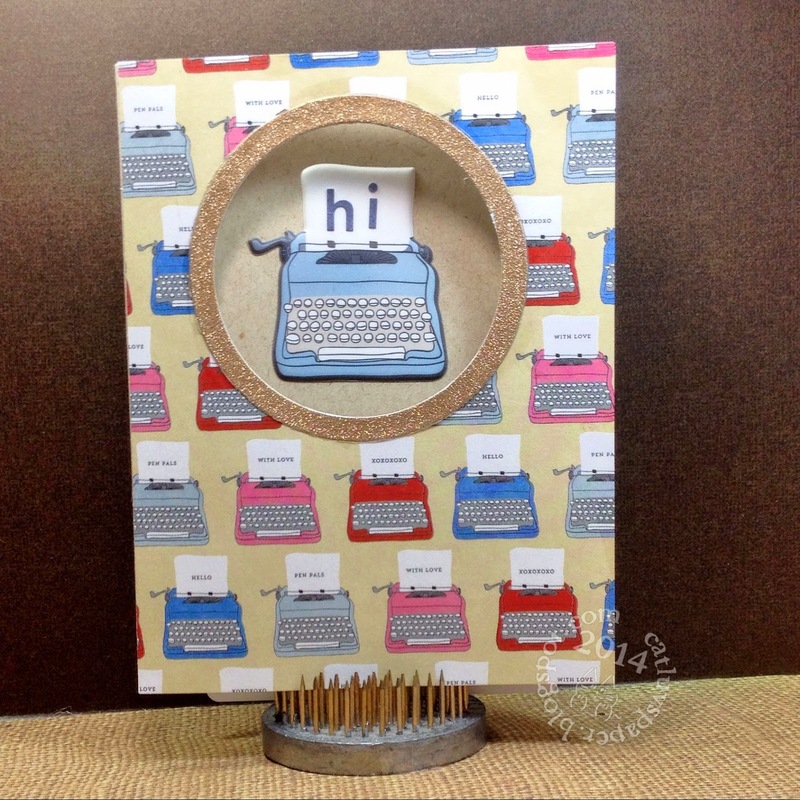 The typewriter inside is a puffy sticker and I added letter stickers from a previous kit for the "hi". 8.This was the last card I made. I so wanted to used that sending my love sticker, but had a hard time coming up with a plan. Then I decided on lots of romantic red envelopes to represent lots of love being sent. Some are flat and some are on foam tape. Thanks so much for making it through this long post! I spent another afternoon making cards, this time from the Simon Says Stamp June Kit. I love the stamps in this kit, they are fun and girly! I had such a busy schedule while in California, that it was difficult to get to see any of my girlfriends. Most of my time was spent with my Dad. I did manage to squeeze in Lunch with some friends the last day I was in town. Most of my friends live about 40 miles from my Dad's home so it requires several hours to get in a lunch or dinner when I visit. I had prepped some watercolor paper with embossed images before traveling to California, just in case I had an itch to do some coloring. I took my box of water colors with and on the 2nd to last day of my trip I finally had an hour to sit down and paint. Upon my return to Maryland, I made the pieces into cards and sent them off to the gals that were able to make it to lunch that last day. It was wonderful to see my girlfriends again. Stamp set is from Simon Says Stamp -Favorite Flowers. 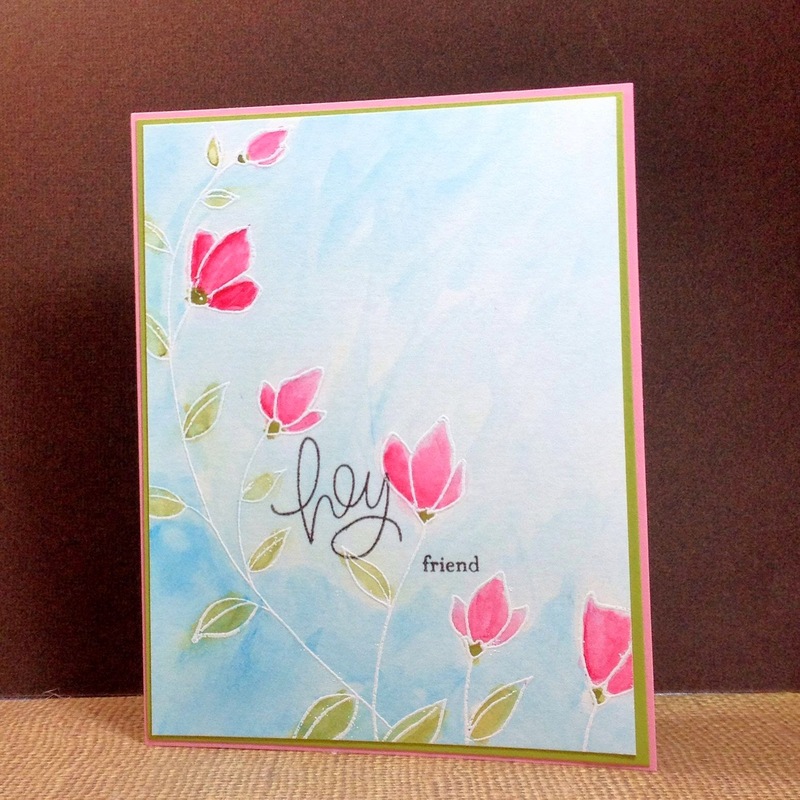 I heat embossed the flowers and leaves in white, then used watercolor paints to add color. Sentiment is inked with Versafine Onyx Black. 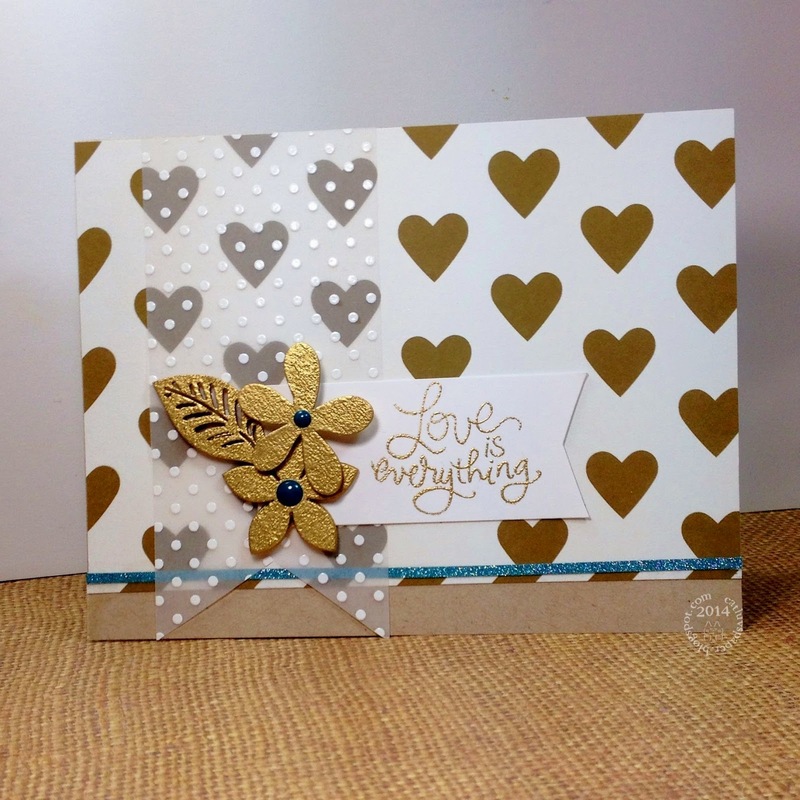 Cardstock is Stampin Up. 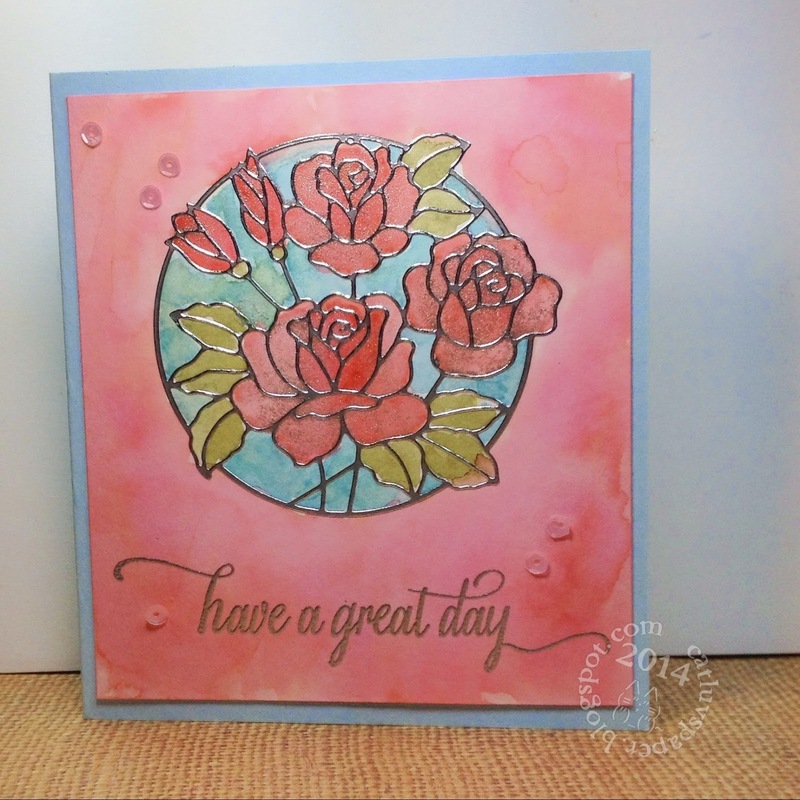 Floral stamp set is from Penny Black-Softly. 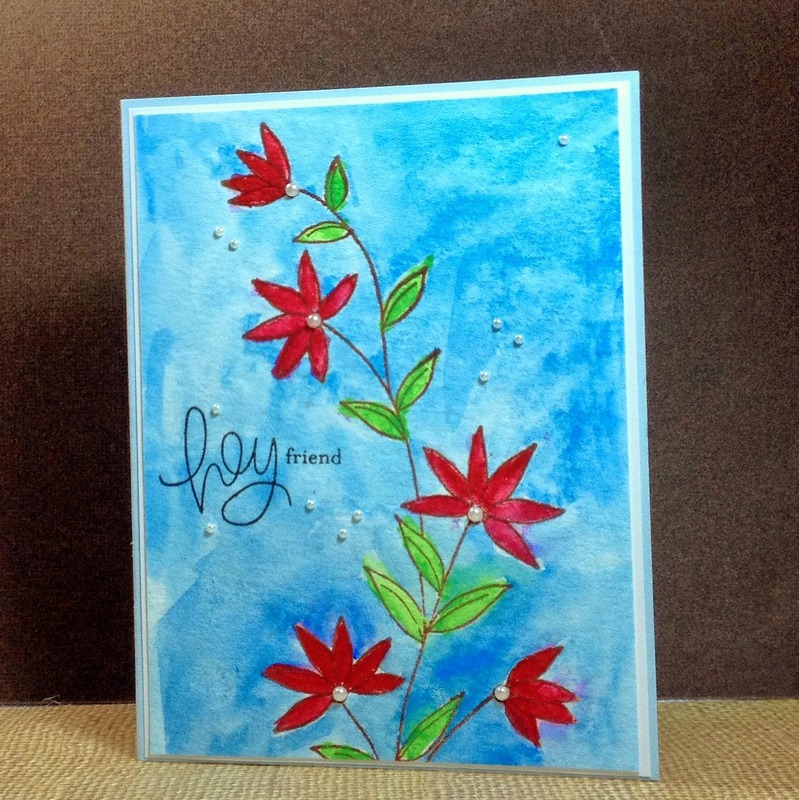 I heat embossed the flowers and leaves in white, then used watercolor paints to add color. 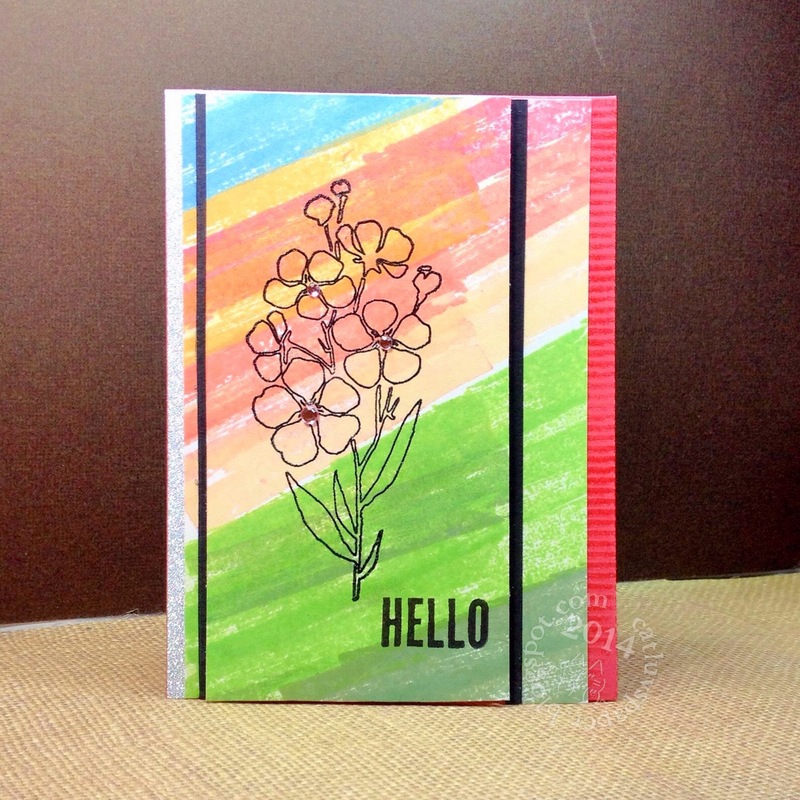 Sentiment is from Simon Says Stamp- Favorite Flowers and is inked with Versafine Onyx Black. Cardstock is Stampin Up. Floral stamp set is from Penny Black-Delightful. 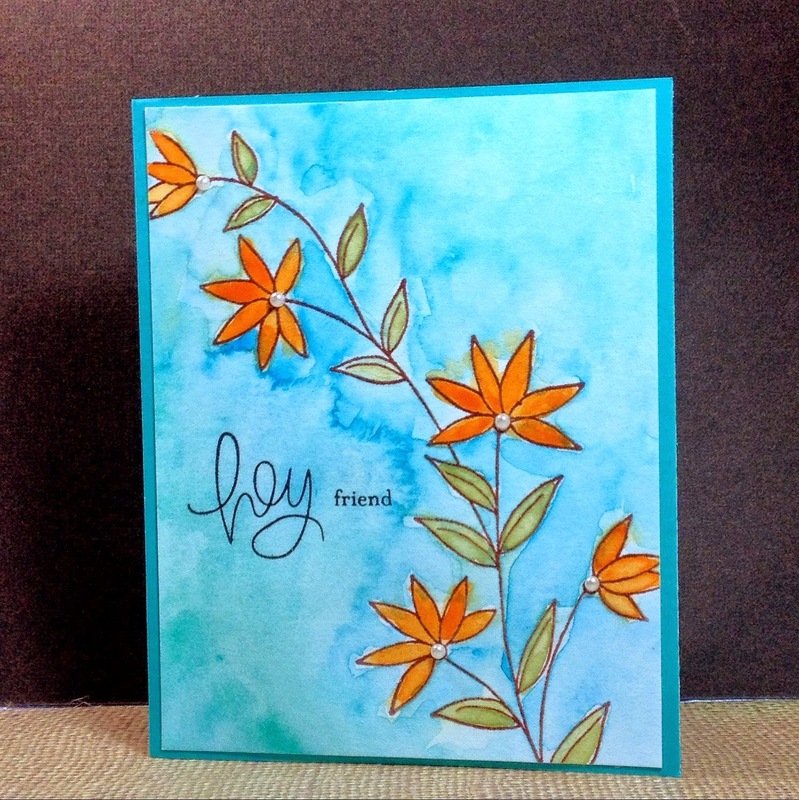 I heat embossed the flowers and leaves in brown, then used watercolor paints to add color. 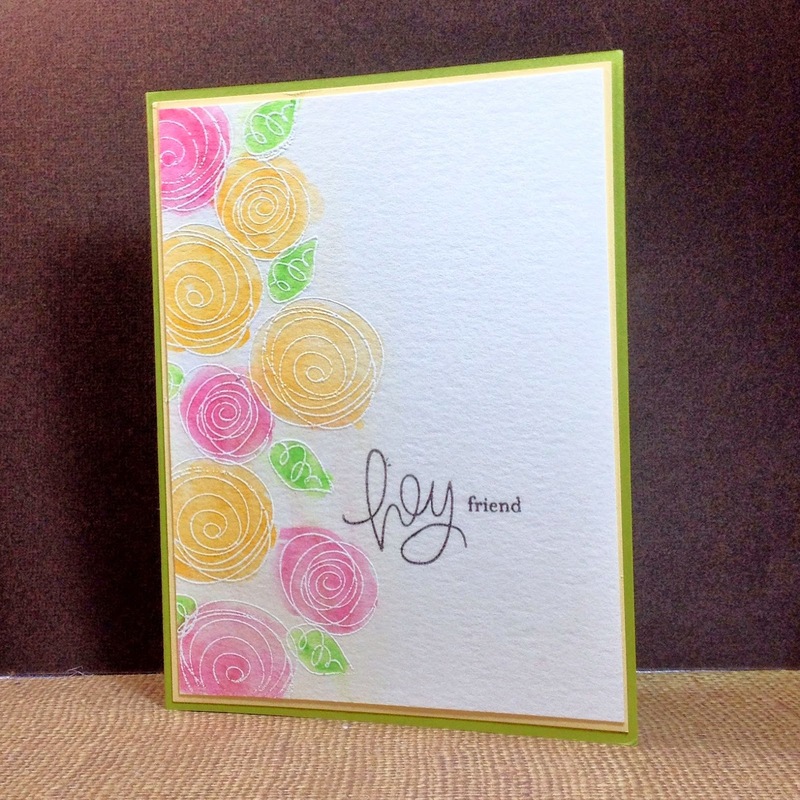 Sentiment is from Simon Says Stamp- Favorite Flowers and is inked with Versafine Onyx Black. 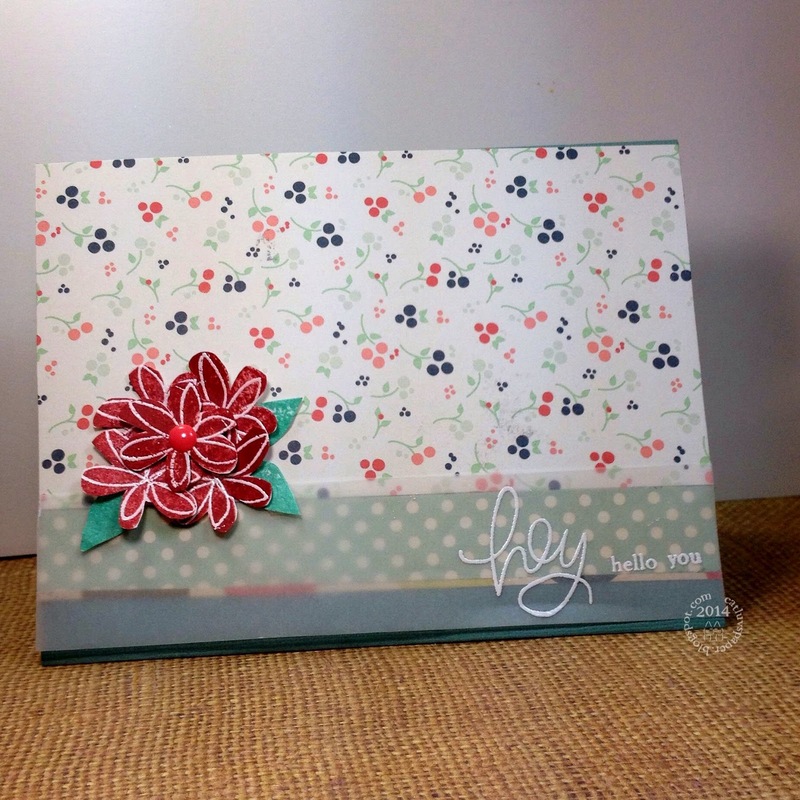 Cardstock and pearls are Stampin Up. Floral stamp set is from Hero Arts Butterfly and Flowers. I heat embossed the flowers and leaves in black, then used watercolor paints to add color. 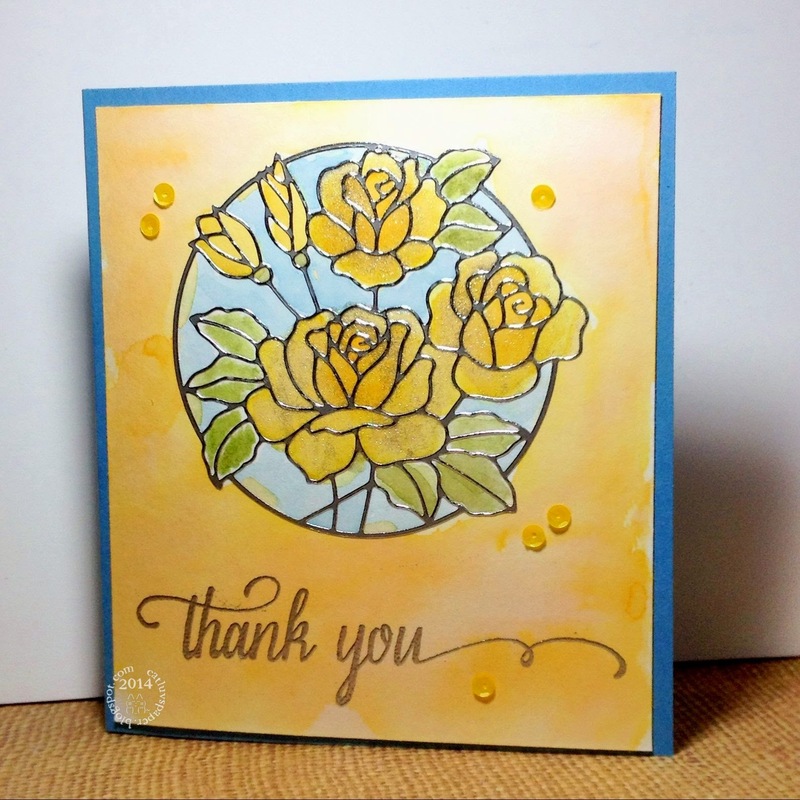 Sentiment is from Simon Says Stamp- Favorite Flowers and is inked with Versafine Onyx Black. 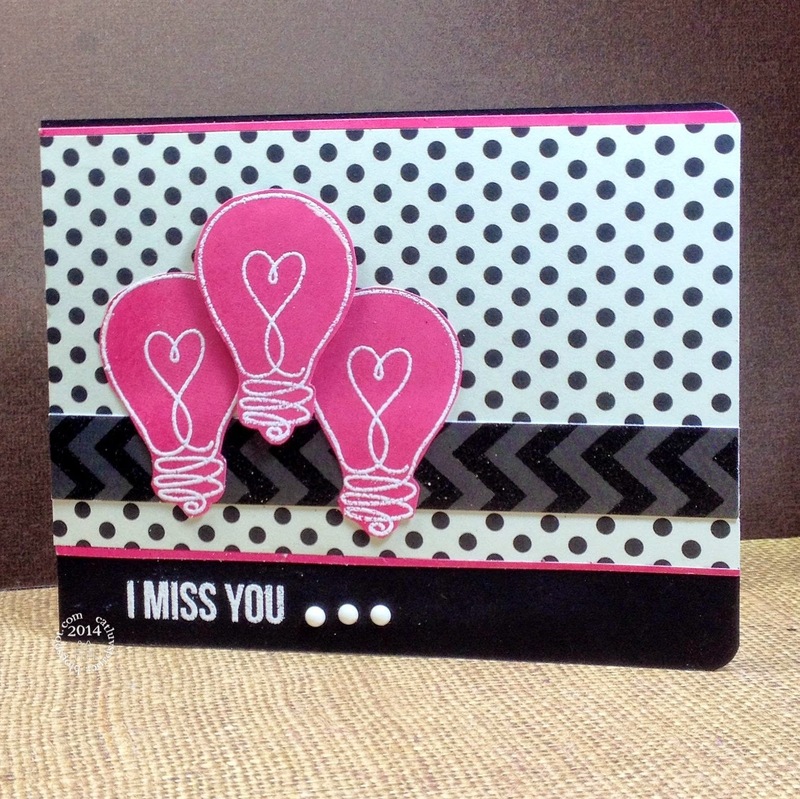 Cardstock is Stampin Up. 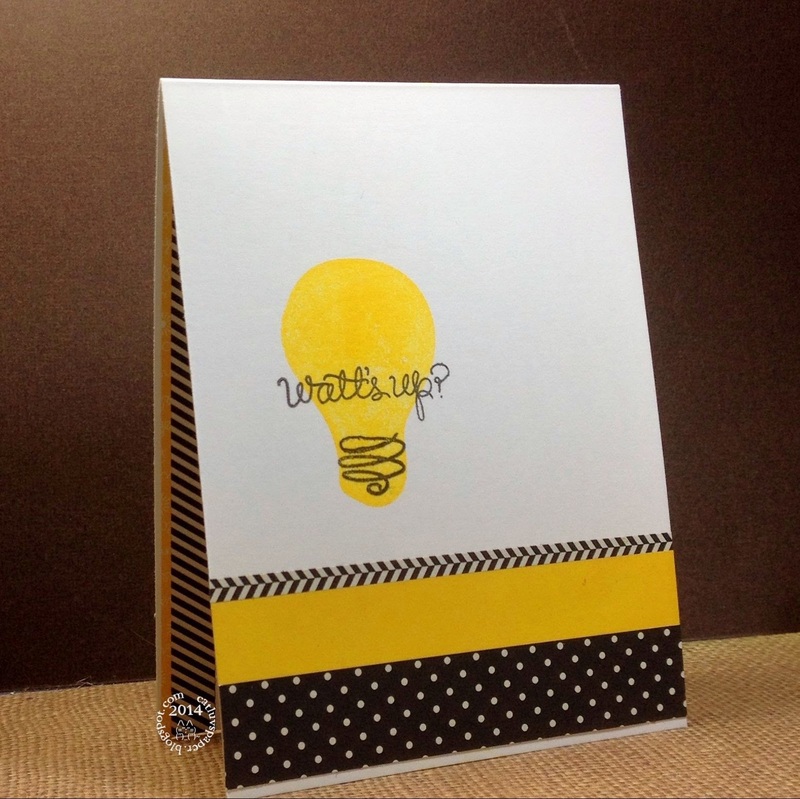 I started subscribing to the Simon Says Stamp monthly card kits in February. I am so far behind in playing with them, so I made a concentrated effort to make some cards. I did manage to make cards with the March kit (posted here) and the April kit (posted here)while tele-crafting with my scrapping buddy in California. Here are cards I made with the May kit. All papers and stamps are from the kit.